Imagine…..you, your family and friends are transported back 30 years and are one of the lucky few to experience a live performance of the ORIGINAL STYX…..This is what Rockin’ the Paradise STYX TRIBUTE is all about….the chemistry, the passion, energy and note-for-note accuracy of a legendary and historic performance up close and personal. We invite you to relive it all over again, our version, our grand illusion. What began in 1970, the popular American Rock Band STYX has remained a staple on the radio domestically and internationally as one of the greatest groups in rock music and the first and only band to have four consecutive multi-platinum albums. 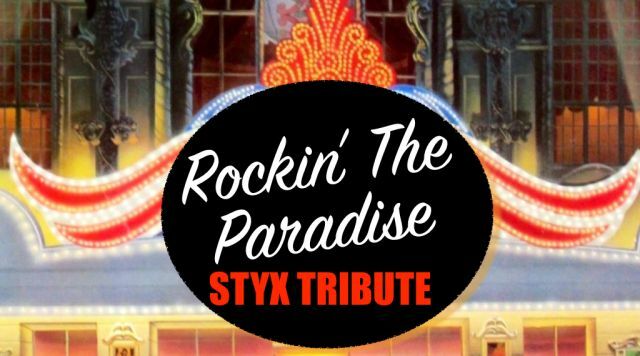 Rockin’ the Paradise focuses on STYX’s trademark high-pitched harmonies, a dynamic guitar assault and a solid rhythm section as the driving force of RTP.